Do you have a band? I mean a real one - it doesn't count if you're playing Rock Band at home on your Playstation. This is pretty exciting, here's your chance to enter a contest to open for Coldplay when they come to to the TD Banknorth Garden on August 4th (here). Imagine performing before one of the biggest bands in the world. The lights go down and the stage is yours. Here is your chance. Live Nation and WFNX are giving your band the opportunity to go on before Coldplay at TD Banknorth Garden on Monday, August 4! To enter, simply sign up by following the contest link below. All entries must be submitted from July 1 - July 7. Click (here) to sign up for the contest. It basically entails you making a video of yourselves and uploading it onto Youtube. I didn't read the rest of the rules because I don't have a band. PS. If anyone needs a pianist, cellist, or guitarist for their band, I'm your man. Just kidding, I haven't played in years - you're way better off going to the New England Conservatory or Berklee School of Music. 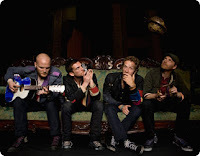 3 Response to "Contest - Be the Opening Band for Coldplay - 7/1"
Do you realize that Capitol Records gains all of the rights to the winning opening band's music? "As part of the Recording Agreement you must agree to and must irrevocably assign and transfer to Capitol, all rights, title, and interest in your submission, including without limitation, all sound recording copyrights therein, pursuant to any demo recording contract as executed between or among the parties, and to forever waive and agree never to assert any and all so-called moral rights they may have or be entitled to in respect of your submission." Coldplay opening band winners Picture Atlantic in San Jose, CA have a Golden Retriever named "Fenway", yep, after the ballpark!